THE SOURCE WAREHOUSE SALE IS THE TICKET! BEWARE OF IMITATORS! Posted on May 23, 2008 at 2:47 pm. That’s right folks, we are gearing up here already to give you the best deals for The Source Warehouse sale. For those of you living under a rock, The Source Warehouse sale is your connection to the best clearout snowboards, boots, bindings, outerwear, skate shoes and lifestyle apparel. Our mission? To put the rest to shame with over 20,000 square feet of mind-liquefying savings and door crashers worthy of battering rams, The Source Warehouse Sale is often imitated, but never duplicated. 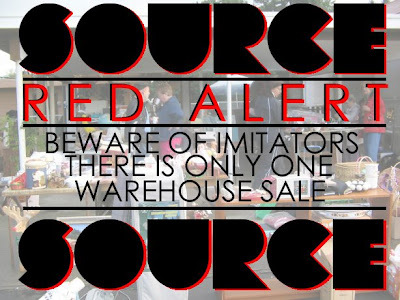 So forget the imitators’ garage sales and get the real ticket with The Source Warehouse Sale! yo, when is the sale? It usually goes down near the end of August, but we are already preparing… it’s gonna be our biggest yet this year!! The sale is rediculous, i went last year and got like 4 pairs of kicks for $100… so sikk!! thats tight. source sale is og, no phonies! no bikes!